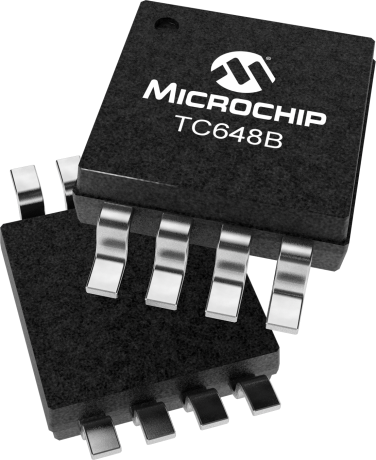 The TC648B is a new version of the existing TC648 fan speed controller. This device is a switch mode fan speed controller, which incorporates a new fan auto restart function. Temperature proportional speed control is accomplished using pulse width modulation. A thermistor (or other voltage output temperature sensor) connected to the VIN input supplies the required control voltage of 1.20V to 2.60V (typical) for 0% to 100% PWM duty cycle. The auto-shutdown speed is set by a simple resistor divider on the VAS input. An integrated Start-Up Timer ensures reliable fan motor start-up at turn-on, coming out of shutdown mode, auto-shutdown mode, or following a transient fault. A logic low applied to VIN, pin 1, causes fan shutdown. The OTF signal is asserted if the PWM reaches 100% duty cycle, indicating that maximum cooling capability has been reached and a possible thermal runaway condition exists.